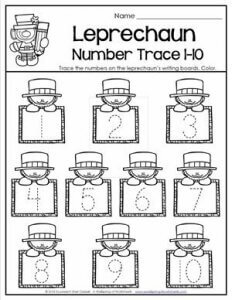 The leprechauns in this St Patrick’s Day worksheet are holding message boards. On the message boards are the numbers 1-10 in dashed lines. Kids get to show you their number tracing stuff by putting their pencils to the paper and following the lines to make the numbers. Woo hoo! Your kids are awesome, aren’t they? Now have them color the leprechauns – remember their beards are red!